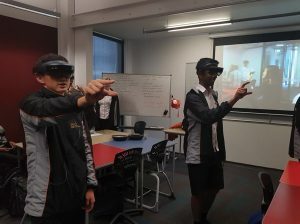 I've blogged previously about Subash Chandar K exploring the possibilities of Microsoft HoloLens with his maths students and now there is a great video above capturing the enthusiasm of his students. “We are a generation that learns through examples and visualisation, not explanation and reading, and HoloLens is supportive of this. It helps us rediscover the touch of ingenuity we have lost through the boring, old methods and disconnected learning environments. It's an interesting observation from the perspective of an active participant in the New Zealand education system and I shared it with 32 Principals from the Taranaki region last week. I was asked to step in at short notice and talk about Microsoft Mixed Reality and HoloLens to them and then allow them to experience it first hand with a HoloLens unit I had managed to borrow for the session. It was interesting observing how they immersed in the experience they were and also how intuitively they picked up the gesture controls. I've demonstrated HoloLens to hundreds of people and there is always a spectrum of how quickly they learn to use it - these Principals were sharp! How do you present invisible technology? Mixed Reality is the perfect medium to visualize the underlying safety features built into a vehicle, by connecting real objects (the car, the observers) with projected scenarios (the holographic cyclist) and how the "invisible technology" actually operates (the sensors constantly scanning the environment around the vehicle and triggering warnings). This is hugely exciting technology that will invariably become more mainstream in classrooms and beyond.